Franklin Federated Church presents "A Few of Your Favorite Things," a concert featuring New England’s premier community handbell ensemble, the New England Ringers, on Saturday, Nov 24 at 7:30 PM at the church at 171 Main Street. The 2018 holiday program will be like none other! This will be a completely audience driven performance, with every concert being different. The 13-member ensemble has prepared over 18 different pieces for audience members to choose which selections they would like to hear! The program is filled with a diversity of style -- music rich in grand symphonic moments plus delightfully light and airy carols and tunes reminiscent of snowy winter days. Some fan favorites will definitely be included, such as Angels We Have Heard on High, The First Noel, and God Rest Ye Merry, Gentleman. There will be FUN and Surprise! 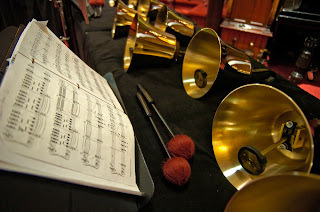 With its commitment to musical excellence, focus on eclectic programming to appeal to a variety of musical tastes, and a healthy dash of showmanship, New England Ringers has been entertaining audiences of all ages for seventeen exciting years throughout New England, New York and Pennsylvania. The highly energetic performers showcase their talents in a uniquely varied program playing with sensitivity, discipline and skill to achieve their signature artistry on a handbell instrument comprised of six octaves of both Schulmerich handbells and Malmark handchimes along with other instruments. Tickets for the concert are $15 each. They can be purchased at the door, or in advance by calling the church office at 508-528-3803. Proceeds from the concert will benefit the mission and ministry of Franklin Federated Church, a welcoming and affirming congregation of the United Church of Christ and American Baptist Churches. Franklin Federated Church is accessible to the disabled via a ramp off the left driveway next to the church.